The US Navy’s current Russia containment tactic in the Black Sea has been unable to negotiate refuelling from naval or civilian fuel tankers while under way at sea, and requires port calls for fuel every seven days. 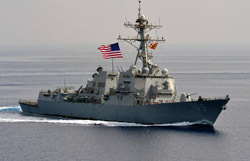 The Navy has announced that its missile cruiser, USS Vella Gulf, put into the Bulgarian port of Varna on May 30. The vessel entered the Black Sea, 180 nautical miles to the south, on May 23. 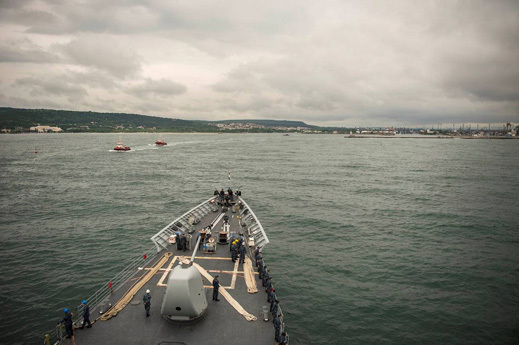 The illustration from the bridge of the Vella Gulf as it approached Varna is a US Navy photograph by Mass Communication Specialist 3rd Class Edward Guttierrez III For the delay of the Vella Gulf in reaching the Black Sea, click. “she can stay in the Black Sea till 14 June 2014.” In February, the Navy’s signals intelligence ship, the USS Mount Whitney, remained off the Russian coast near Sochi for the full 21-day limit, departing south only after Ukrainian President Victor Yanukovich had been overthrown and his replacement installed in Kiev; and after Russian forces had moved out of their Crimean bases to secure the peninsula from the north, and commenced the accession process. 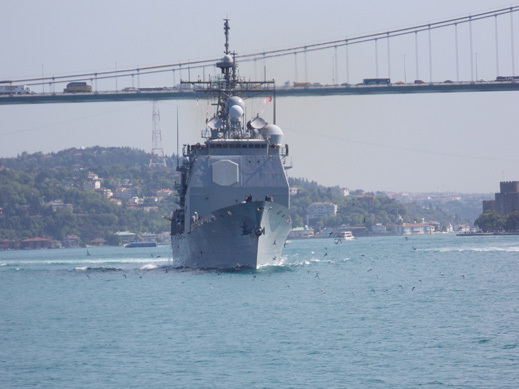 The USS Taylor overstayed for 32 days in the Black Sea in February, reportedly because it had run aground at Samsun port, damaging its propulsion and rudder systems. On its second cruise in April and May, the Taylor was in the Black Sea for 19 days. In March the USS Truxtun was present for just 14 days, as was the USS Donald Cook for its April-May cruise. The ports selected for refuelling these vessels have been Samsun, Turkey; Constanta, Romania; and Batumi, Georgia. On the supply of bunker fuel at Batumi port, read this. Depending on how fast she moves over how much distance – the Vella Gulf‘s motto is “Move Swiftly, Strike Vigorously” — has a maximum speed of about 33 knots (60 kmh) and a fuel capacity range of 7 days if she moves slowly. Its four marine gas turbine engines are of General Electric’s LM2500 type. Since the US Navy began deploying its warships in the Black Sea in February, the refuelling requirement – along with the special security and fuel quality measures associated with this – have shortened cruise range and required weekly stops. After the Taylor’s Montreux violation at Samsun three months ago, the Turkish Government appears reluctant to host fresh portcalls for refuelling, or charitable purposes. A recent study of the annual Sea Breeze exercise by Alisa Moldavanova, a Ukrainian researcher at the University of Kansas and the US Foreign Military Studies Office at Fort Leavenworth, has reported substantial local opposition to this US naval operation in Crimea and Odessa.